It seems to me that Christianity’s main icon, the cross, is at once deeply loved and hopelessly loathed. Probably every emotion in between applies as well. One commentator recently explained that using the icon of the cross to reflect on Jesus’ life was like using a bullet to remember the life of Martin Luther King. Such an interpretation puts heavy stead on the cross, as the Roman empire’s most acute weapon of political torture. The cross can seem repugnant as a symbol, when viewed through this strict historical context. And it is hence open to severe misuse by our most mechanical type of thinking. Perhaps unwittingly such thinking tells the story of the cross as a separation of the divine and the human. The popular interpretation then comes into play. An external deity makes a human sacrifice. Whatever the motivation for this sacrifice, the inescapable conclusion is that divinity is a violent force. But metaphorically we can find a very different meaning. This is a story about the meeting of the temporal and the non-temporal. Humanity and divinity are not separated. So in this story, divinity arises from the refusal of the human to blame others. The divine human takes the stance “I am big enough to realise I am always part of the problem AND the solution in every circumstance, and I’m going to play some part in the consequences of both.” In this metaphor there is not room for “we are pure over here” and “you are impure over there.” It’s much more messy than that and we must delve into the mess, relate to it and find out where to go next together. Divinity doesn’t blame. 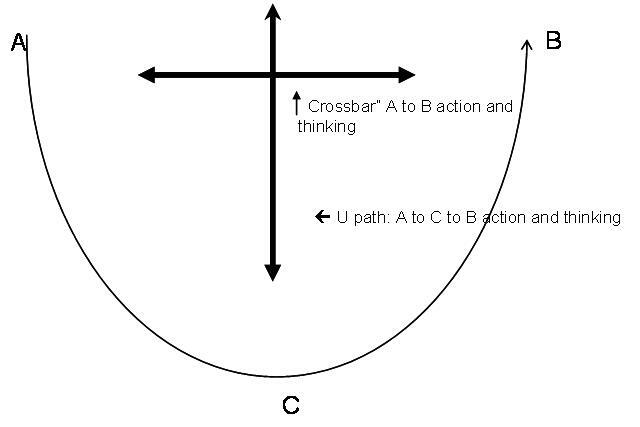 Using the “U” path terminology again (diagram 5), it indicates that a life well lived – a truly “called” or divine life - is not just about the surface or time-bound dimensions (the path from A to B). It is equally about the deep relational dimensions as well (the path down to C) which are timeless or eternal dimensions. It’s about delving down into the mess rather than looking for a fix objectively (out there). 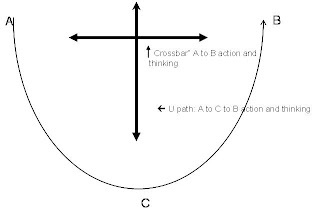 The alternative is “life on the cross bar” (the A to B path). Here we might pretend that we are practising “the eternal” while we are really living a life of responsive problem fixes. This, in marketing terms, is “green-washing” where we attempt to “deify” the overtly mechanical with a veneer of “relationship language.” There is a stark example of this in a book I am currently reading, Common Ground in a Liquid City: Essays in Defense of an Urban Culture . In it the author Matt Hern, decries the highly sustainable image of his home city, Vancouver, as a farce. Hern sees the more walkable streets, the multi-use buildings and the density “solutions” as top-down fixes to appease an environmental challenge which is viewed as “happening out there.” But, Hern writes, until sustainability plans are locally generated (that is, about real neighbourhood participants, right where they are) streets will remain sterile, housing prices will continue to sky-rocket and poverty levels will increase. The “solutions” are not really about sustainability because they are not based on real relationships or, in other words, an honouring of each element of the cosmos as an authentic participant in life.